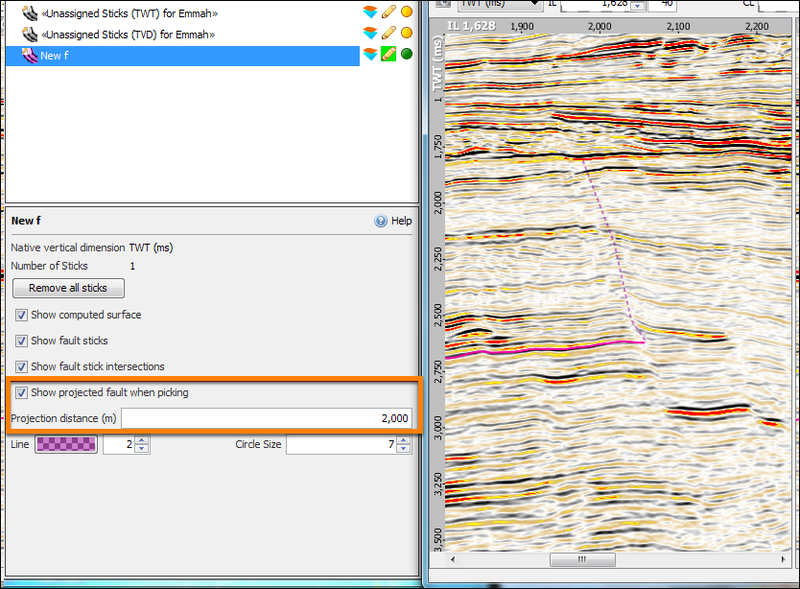 Once you have picked your faults, you can view the faults in 3D View to show the computed fault surface. In addition, you can also display fault intersections with a particular horizon in Map View and create fault polygons based on those intersections (see Using Fault Polygons). Note: For the surface to be displayed in converted domains (e.g. flattened spaces or TVD), the entire fault must be convertible to the domain. i.e. If any part of a TWT fault (i.e. any pick) extends past the edge of the velocities, the surface cannot be shown in TVD. If any part of the fault is outside the boundaries of the horizons used in a flattener, the surface cannot be shown in flattened space. Individual fault sticks have the same rules for display. Once you have picked the fault sticks, you can display them in 3D View in the whole or intersection mode. In the Control Panel, open the Fault tab. Go to the fault item and click the Show whole or intersecting fault in 3D icon to switch the display of the fault sticks between the whole and intersection modes in the 3D View. Tip: If you have many faults, you can switch the display for all the faults in the 3D View between the whole and intersection modes by clicking the Show whole or intersecting fault in 3D icon at the top of the Fault tab. 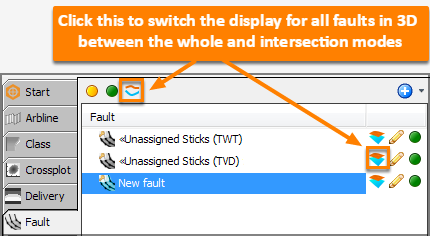 To display the fault intersections in Map View, select the Show fault stick intersections check box. If the fault intersection is not displaying in the Map View, make sure Fault Intersection is set to Horizon or Both in the Display tab of the Map View. To increase or decrease the size of the intersection points, type/adjust the size at Line. Note: If fault intersects the horizon in an area without values, no fault intersection is displayed. Interpolate or regrid the horizon to create a fully filled version that will display the intersections. After picking a fault stick, select the Show projected fault when picking check box to project the fault out horizontally to aid picking on vertical sections. The Projection distance (How far out to project the fault) can be adjusted.